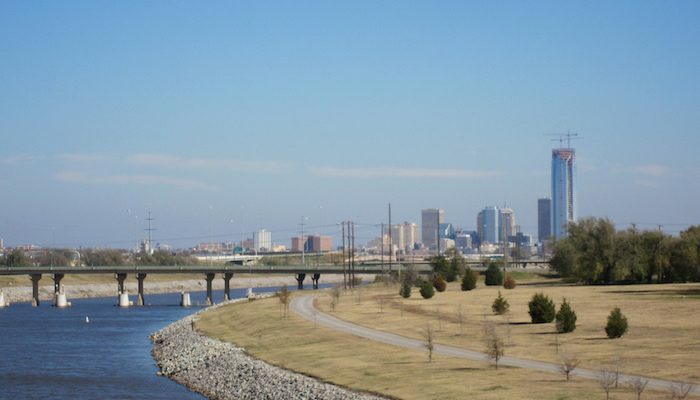 Situated along the north and south banks of the North Canadian River (known locally as the Oklahoma River), these paved trails stretch more than 13 miles along the north and south banks of the Oklahoma River. Most of the trail is quite open, with good water views. Even though the overall trail is 13+ miles, we recommend the centrally located section comprising the 9.5 mile loop option, below. Loop Option: Not all of the bridges crossing the river are runnable — some are quite busy highways — but runners can string together a 9.5 mile loop using the Portland and Robinson bridges. MAP. Not sure where to start? There are parking areas at the Oklahoma Boathouse, Wheeler Park, Wiley Post Park, the Mat Hoffman Action Sports Complex, the Exchange Ave Bridge, Lincoln Ave Bridge, and SW 15 and Portland. The Oklahoma River Trails make for a wonderful long run, but they aren’t the only multi-use trails in Oklahoma City. These three paths, which easily connect to the River Trails and other networks, are important supplements to the Oklahoma City trail system. South Grand Trail: Though perhaps not the most scenic route in Oklahoma City, the South Grand Trail is a 10 mile path starting from the Oklahoma River Trail and heading south to Industrial Heights. From here, it bends west and runs along SW36th street to Trosper Park. The trail then bends north along East Grand Boulevard back to the river. MAP. Will Rogers Trail: Another new multi-use path stemming from the Oklahoma River Trail, the Will Rogers Trail is a a long off street pathway paralleling busy streets north to Lake Hefner. MAP. Katy Trail: The Katy Trail sets out from Washington Park, just northwest from the Oklahoma River and the Bricktown neighborhood. This 6 mile multi-use path travels along a dedicated space on the path of the former Katy Railroad, though some sections utilize on-street bike lanes. MAP.